joy and hope to many. Cindy Miller is the wife of Frank Miller, and the mother of Leslie and Brandon. 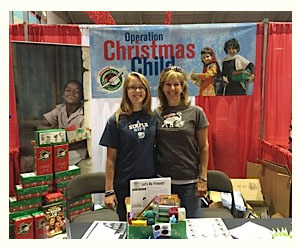 She has been an integral part of Operation Christmas Child for many years. We are so lucky she has chosen to share her talents with this wonderful organization and the organization’s mission with Hayworth-Miller. Stop by any Haywoth-Miller location, pick up a shoebox, and return it filled. Operation Christmas Child is a wonderful organization that our family has been associated with for many years. We began packing shoeboxes in 1998. We now have the 4th generation of the Miller family packing shoeboxes. We collect items all year and start packing our boxes during the summer months. These gift-filled shoeboxes are sent to children all over the world. 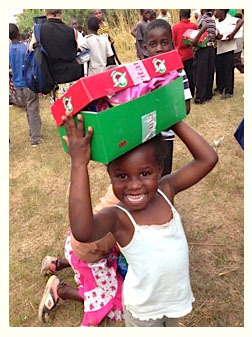 Most of the children who receive the shoeboxes have never received a gift before. Their faces light up when they open their shoeboxes. They love seeing pictures and letters written to them from the people who have packed their shoebox. 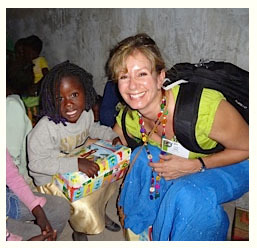 A couple of years ago, I was blessed to travel with Operation Christmas Child to Zambia, Africa. I saw first hand what joy these shoebox gifts will bring to a child. They are a tangible way of showing the children that someone loves and cares for them. A lot of the kids cannot go to school without school supplies. We always try to include paper, pencils, coloring books, crayons and some special “wow” item in our shoeboxes. We have put in dolls, stuffed animals, soccer balls, baseball gloves or articles of clothing to name a few. Since our parents are deceased, we pack special shoeboxes in remembrance of them each year. They were always a big part of our shoebox packing. We hope you will join our family this year in packing a shoebox for a special child. Hayworth-Miller strives to be a positive part of this community, hoping to encourage not only our employees, but also members of this community to help others. Operation Christmas Child is an organization that is close to the hearts of those at Hayworth-Miller.